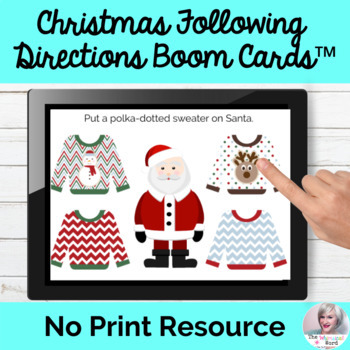 Following Christmas Directions BOOM Cards™ features 20 interactive, self-checking task cards, that ask your student to follow a single or multi-step direction using holiday themed objects and characters. 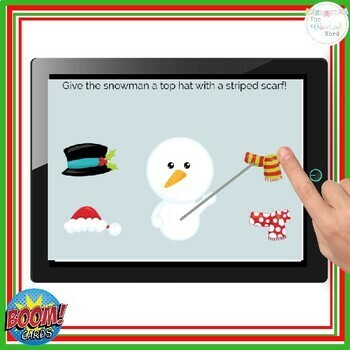 With a drag & drop feature, your student can play this game easily on an iPad, laptop or smart device. Want to see this deck in action? Click on the link below to play! Boom Cards live in the cloud. They can't be printed. They play on most modern browsers, Android, iPads, iPhones, and Kindle Fires, with a standard wifi connection. You open a Boom Learning account to play them (to protect the children). Create Fast Play pins to assign your Boom Cards to students. PLEASE NOTE: When you purchase this deck, you will be given a LINK to download your BOOM CARD purchase. You will NOT be given a set of cards in pdf format. Need more info? Check out the BLOG post I wrote on how to use BOOM CARDs in speech therapy! 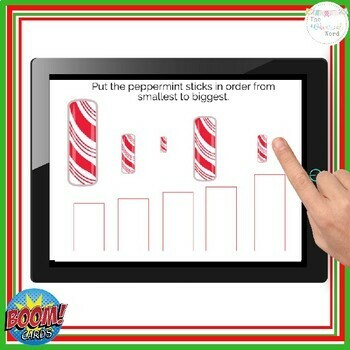 Looking for MORE Boom Card™ Decks, or NO PRINT products for your youngest students? Check out my listings by clicking below! Looking for more NO PRINT Christmas materials? Check out my Christmas Shopping Inferences! Disclaimer: The Whimsical Word is not affiliated with nor endorsed by Boom Learning℠. Both Boom Learning℠ and Boom Cards™ are registered trademarks of Boom Learning, Inc. Logo and names used with permission.